Hungarian Lángos? Street food? It’s a misbelief that street food does not exist in Hungary. There is even a wide variety of old traditional and well-known international food, especially in Budapest as a melting pot of European nationalities. The name “lángos” comes from the Hungarian word “láng”, which means flame in English. The origin of lángos comes from the times when families baked their own bread at home. A little piece from the end of the dough was flattened into a disk and prepared on an open fire with the help of a grid. It was one of the favorite foods of kids. With the arrival of modern bakeries home-baked bread has nearly disappeared from the households; therefore, the preparation method of langos also slightly changed. Instead of preparing it in the oven vendors put it in a large pan and fry it in abundant oil. Actually, some believe that it is very similar to fry bread associated with Native American cultures. Sometimes it is called the Hungarian pizza by American tourists visiting the country. However, this special Hungarian food is quite popular mostly at the Christmas markets in Hungary and Germany; it is absolutely not connected to the birth of Jesus Christ at all. It is rather associated for most Hungarians with summer time and holiday at the famous sweet water lake, the Balaton, where it is a popular snack after swimming in the water. As a matter of fact, it is made of flour, yeast, salt and water (a kind of bread dough). You can also prepare it with yoghurt, sour cream or milk instead of water, plus a dash of sugar along with salt and sometimes with flour and boiled mashed potatoes, which is called potato lángos. First, dissolve the salt in the water. Mix the flour with the yeast and add the salty water. Work the dough with your hands until it becomes smooth. Cover the dough with a cloth and let it rise for about half an hour. Then carefully put the dough onto a floured surface, stretch it out, and cut round shapes from it with a bigger glass. Stretch out each piece and leave them for another 30 minutes. Heat the oil in a saucepan and place the langos into the hot sunflower oil. Fry it on one side until it gets golden brown then turn. Serve while it’s hot, topped with sour cream and grated cheese, garlic or garlic butter, or doused with garlic water. Sometimes it is filled with different ragus, folded, and fried that way. Moreover, it is also available in a tiny size called ”Baby lángos”. Lángos can be cooked at home or bought at markets and street vendors around the country. There are some regions where restaurants serve it instead of bread next to the hotpots or one-course dishes like Goulash or stews. To be honest, there are always many people lining up in front of the stalls built up on the markets or street festivals. Sometimes, in smaller towns, the stall is actually a hole-in-the-wall with only a single bench and a couple of counters in the courtyard; but that’s what it makes so familiar and pleasant. Regarding the price, it is relatively cheap depending on the type of toppings you request. It is always freshly baked after order which takes about 2-3 minutes. So it’s fresh, hot and crispy. I hope you got interested in this savory and taste it during your stay in Hungary. As you can see, although it is regarded as street food it has occupied a prominent place in the Hungarian cuisine. If Kürtöskalács is the queen of fairs and festivals, then the Langallo is the King of them. 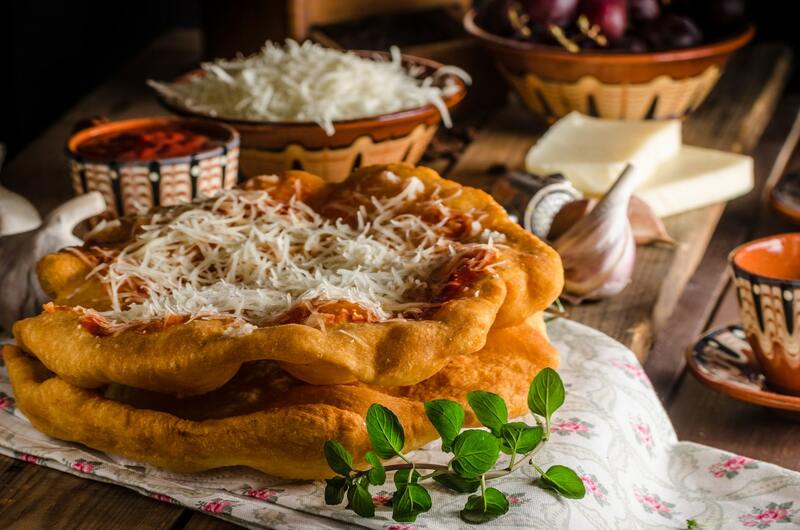 Since it is not fried as the langos mentioned before but baked in a traditionally built oven (furnace), and to be honest the name does not really fit to this masterpiece of the Hungarian cuisine, but it is worthily famous between Hungarian people and tourist as well. During your visit to Hungary visit at least 1 of the markets or fairs, festivals and try this delicious Hungarian food one after another. You will not regret it, we promise.